Bahujan Samaj Party president and UP Chief Minister Mayawati said today that she had reached an understanding with Congress president Sonia Gandhi regarding the UPA candidate for the presidential election. All India Anna Dravida Munnetra Kazhagam (AIADMK) supremo Jayaram Jayalalithaa today categorically denied that the newly formed third front of regional parties was backing Vice-President Bhairon Singh Shekhawat as an independent candidate for the presidential election slated next month. 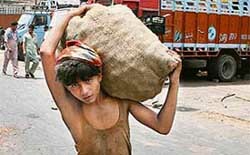 Are existing measures enough to check child labour? An investigation report of the state Vigilance Bureau placed before the Supreme Court by the Punjab government in the multi-crore Ludhiana City Centre scam has claimed that the Amarinder Singh government had kept the trustees of the Ludhiana Improvement Trust (LIT) totally in the dark about the project. The CBI was dealt another blow today when judge Harichi Doi of the first court of Eldorado ordered the prosecution to pay Ottavio Quattrocchi's legal fees. Embarrassed by Graham Ford’s refusal to become India’s cricket coach, the BCCI today appointed 72-year-old former skipper Chandu Borde as manager for the tour of Ireland and England, and decided to search afresh for a new coach. Former Pakistan cricket coach Bob Woolmer died of natural causes, and was not murdered as initially suspected, the Jamaican police said today, bringing to an embarrassing close a three-month investigation that had gripped the cricket world. An estimated 12,000 ground staff of Indian tonight went on a nationwide flash strike accusing the management of going back on its assurances to them on their demands for wage arrears and better promotional prospects. The government has set three conditions to resume the stalled peace initiative with banned ULFA, that included a direct communication from the outfit's top leadership indicating their willingness for talks with the Centre, mediator for ULFA talks Indira Goswami said today. Persisting heat wave in various parts of this region has rendered milch cattle dry. During the past two days, when the day temperature hovered around 48° C, milk supply to various milk plants of cooperative milk unions had gone down by 40,000 litres per day. Besides, milk collection by private sector plants has gone down by 1.6 lakh litres during the same period.